This tire highlights the value of having true all-terrain tires. The trip started with clean tires which quickly got an even coat of dust. Then rocks on the trail removed some of it. Well, I left Wickenburg to stage in Congress for a quick trip to Scottsdale to see a good friend of mine. The best part is that I suckered him into paying for lunch. The second-best part is that I managed to capture some usable video on the way out of camp. I lost nearly all of the audio however, due to my not realizing that two devices were both inadvertently set to use the same bluetooth microphone. As far as they are concerned, this is not a cooperative venture. So you’re spared both my droning, monotone commentary and the pocketa-pock of the idling Mighty Furd for 10 minutes. That’s probably good, too. My loss is your gain. One of two branches of a trail heading back to where I’d originally planned to camp. Pretty nice back here. Very pleasant. I decided to walk the same trail I’d driven last year while attempting to get back to a strange little area I’d scouted on the e-bike and hoped to camp in one day. On foot, I couldn’t get very far in because of the energy-draining meds I’m on, plus the full sun and heat. I call these The Three Amigos, and have walked past them enough times that I now (quietly) ask, “How ya doin’, boys?” They’re about as tall as I am. Ahead, some nice hills. Off to the right, a mild drop-off into a valley. Above, a beautiful sky. 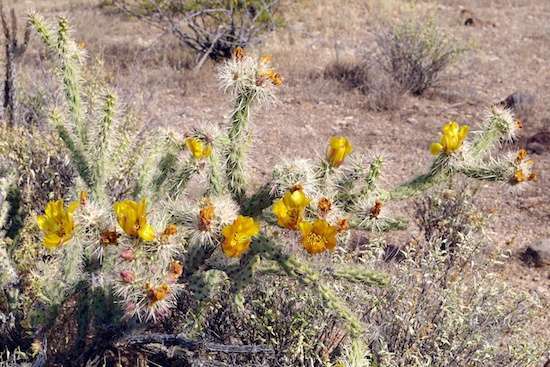 Since the Kofa National Wildlife Refuge was going to be too hot for my tender sensibilities, I decided to stay the one night and the next morning, and then move on to my principal stop at a higher, cooler elevation. 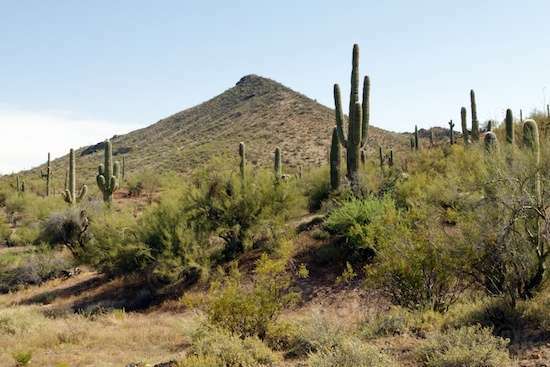 I was surprised that the overnight low at 60 degrees felt cold to me, and realized that I’d need to break out a wool blanket or two when I camped in cooler Wickenburg. The warm sweats and flannel sheet weren’t cutting it in the way I’d expected. Maybe it was just me. Sunset atop a plateau in Wickenburg, with my campsite in shadow. GPS: 33.911597, -112.815678, according to Google Maps. 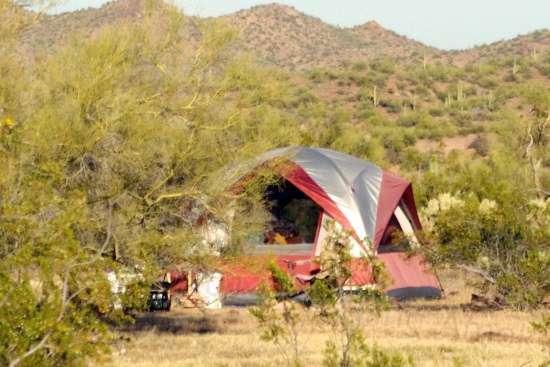 Having climbed up an interesting slope to get to my first camp, I stayed there for a few days before moving to another location in Wickenburg, Arizona. This is State Trust land requiring a permit, and I’ve never seen anyone checking for them in past visits. So I was surprised on my first morning there when someone in a white pickup truck came up the rise, got out and checked the Furd for the tag in its window before departing. Secluded as my campsite was, the Intrepid was high and in plain sight of the common campground below. The trail I was on continued further, but the “V” at the bottom of a dip ahead posed a challenge for the overhang caused by the StowAway cargo box at the rear of my rig. Stopped on a trail in Wickenburg, Arizona. It was a day just like any other day, only more so. That is to say, I had the Escapees SmartWeigh guys at North Ranch in Congress Arizona ply their trade on the Intrepid, and got more than I bargained for. Weight, that is. Steel yourself: here comes the geeky part right up front. 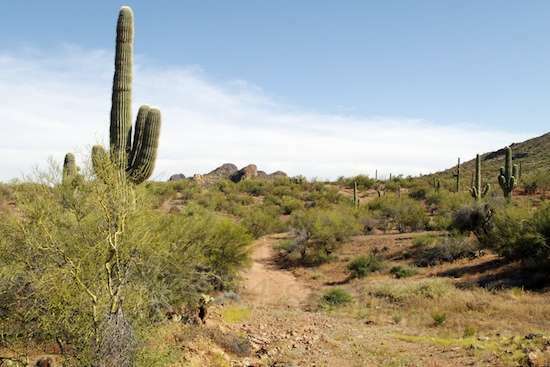 Once that’s over, it’s trailblazing in Wickenburg, kinda. With a GVWR of 10,000 pounds, once you’ve filled the Mighty Furd with fuel and stuffed in all the passengers and crapola that you can, the resulting weight should not exceed 10,000 pounds. It will carry it just fine and the available acceleration is still sobering, but running at the GVWR limit shortens the needed maintenance intervals by half, and generally wears out the drivetrain and brakes more rapidly than if the truck were used solely for transporting bags of potato chips. 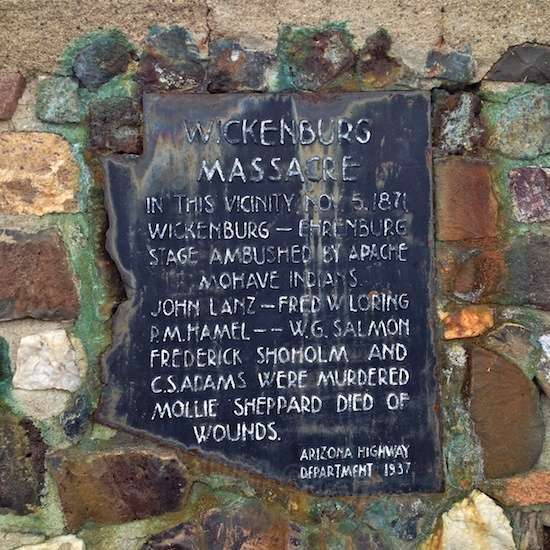 The 1937 stone structure commemorating the ambush of the Ehrenburg-Wickenburg Stage in 1871. I was surprised to find this plaque at the end of an outing in the Mighty Furd, one that led me down some Jeep trails narrow enough to scrape its paint with thorns as it lumbered onward through open range. 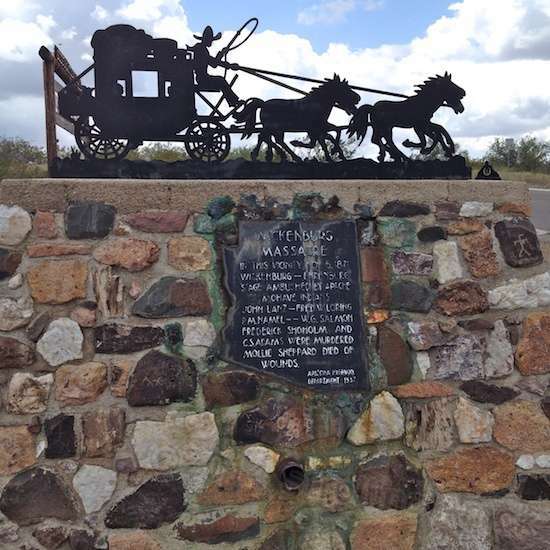 I had that weird sensation of history as I picked my path, and was considering how difficult it would be to prod a loaded wagon from one tiny encampment to another in the West’s early days. Winding up and down from hill to eroded wash mile after mile, would be quite the adventure. Then my surprise at finding this memorial after returning to pavement made me realize that the threats to travel were not limited to terrain at that time. I stopped here when it struck me that I never thought I’d have the opportunity to do this kind of thing or see these kinds of sights. But they’re out there, waiting. I sheared off all the storage stuff on the Aurora e-bike the other day, and went out for a ride on a trail leading north. Rather than blather on about it, I’ll just show off the snaps here. Ditto on this one. You know, you sure don’t see much of this in northern Illinois. 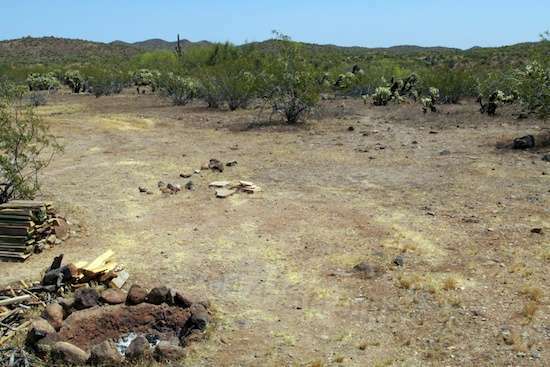 Well, I had scheduled my trashed campsite cleanup for today, since I had a trip to Glendale AZ yesterday, and I didn’t want anything to complicate that. Lo and behold, my earlier blog post about the messed-up campsite here on State Trust land apparently turned into a call to action for one long-time traveler and new reader, known here as Roger. He saw the posted pictures and went out yesterday to have a look-see for himself. He noticed that the three large buckets had already been scrounged, but was appalled enough at the remainder, that he loaded what was left into his own pickup and took it into the waste recycler just outside of Wickenburg! Boom! Gone! While he was at it, he also picked up some cardboard in the main area, and some beer bottles left at the entrance by locals. He told me that tidying up the various sites he visits is a pretty common practice, since he and his bride appreciate having so many sites available to us at all. Kind of drives home to me the difference between yammering about a problem and just quietly taking care of it, doesn’t it? All thanks be to Roger! Ah, the beauty o’ Nature. I went out for a walk a couple of days ago. (Yes, I do walk occasionally.) I went by a campsite that had until recently been occupied by a tenter for at least as long as I’ve been here. I’d seen his newish silver Dodge pickup depart and arrive a few times.